A modern Berber village, founded by fishermen & agricultural families. 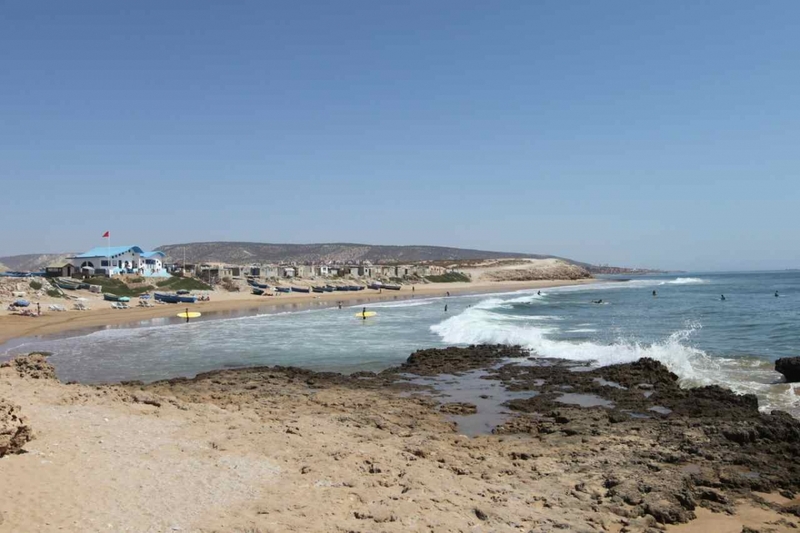 It has long been a popular spot for family holidays and camping, due to the special microclimate providing some relief from Agadir city’s summer heat. In the 1970’s the region became established on the hippy trail. Living was cheap & easy and the warm hospitality of the Berber people made travellers feel welcome and comfortable to stay awhile. The mellow climate, peaceful pastel hues of the surrounding hillside teamed with blazing winter sunsets and the transient nature of holiday makers, fishermen and seasonal agricultural workers have created a certain vibe. These days the village has a harmonious mix of the generations of the original Berber families and also many European residents along with international surfers and yogis that still flock here for it’s fantastic year round climate and laid-back natural setting along some of the best Atlantic coast line Morocco has to offer. Local hospitality is still warm and welcoming, the small wooden fishing boats still go out for the daily catch. The agriculture has dwindled however, making way for the new resort and golf course and a new wave of travellers. Must do: Surf, terrace yoga, sample the fresh seafood on offer at Chez Brahim’s beachfront restaurant. Is our more recognised village neighbour, 5kms to the north which can be accessed easily on foot via the 5km stretch of sandy beachfront, it makes a fantastic morning walk. Upon arriving in Taghazout you will enjoy exploring the winding alleys and pebbled shore front with mismatched houses built on top of each other. The beached wooden fishing boats also add to the quaint charms of this hippy little surf town. Must do : Pop into one of the bustling cafés or colourful boutiques and check-out the local market held in the village square each Friday. Just around the bend, 2kms to the south lies the village of Aourir. Gateway to the rich hinterland known as Ida-Outanane Mountain region, very worthwhile and easy to explore on daytrips. The village itself is popular for it’s traditional tagine restaurants, though is perhaps better known as Banana Village. Wednesday is the best time to experience the hive of activity as the main streets comes to life with the weekly souk (open air market) where locals come from surrounding villages near and far to buy, sell and trade their wares and produce. It can seem a little chaotic, but get amongst it and enjoy the cultural sights, smells & sounds of this weekly event… bargain for a memorable gift or souvenir or get in early to buy the best fresh produce on offer. Must do: Sample fresh bananas from the street vendor’s cart. Sit down to a traditional tagine meal in one of the street side restaurants, Wednesday souk. Agadir City is just 15 minutes drive from the riad. The recently refurbished beachfront promenade and Marina complex with trendy cafés, restaurants and international clothing stores is a great way to spend the day exploring on foot. The main traditional Souk Al-Had of Agadir is well worth wandering around for a few hours. Everything is available here from an exciting array of picture perfect fruit & vegetables to argane oil, spices and herbal cures, quality handmade leather goods, colourful embroidered caftans, exotic lanterns, hand painted ceramics to clothing and traditional world music. Must do: Experience sunset from the ruins of Kasbah Oufella lookout, Souk El Had, Amazigh Heritage Museum, Sail out on the bay, Seafood lunch in the port. Discover the eastern extremity of the Atlas mountain range. Agadir’s picturesque Ida-Outanane region boasts altitudes up to 1400m and countryside rich in wild medicinal and aromatic herbs. Argane, olive and almond trees are abundant amongst date palm oases. Small rural villages are dotted through the fertile mountains and valleys which produce these valuable harvests. A sense of living off the land and close to nature can be experienced anywhere you stop. Honey production is a widely respected livelihood in these parts. The region is famed for it’s wild thyme “zatar’’ honey. 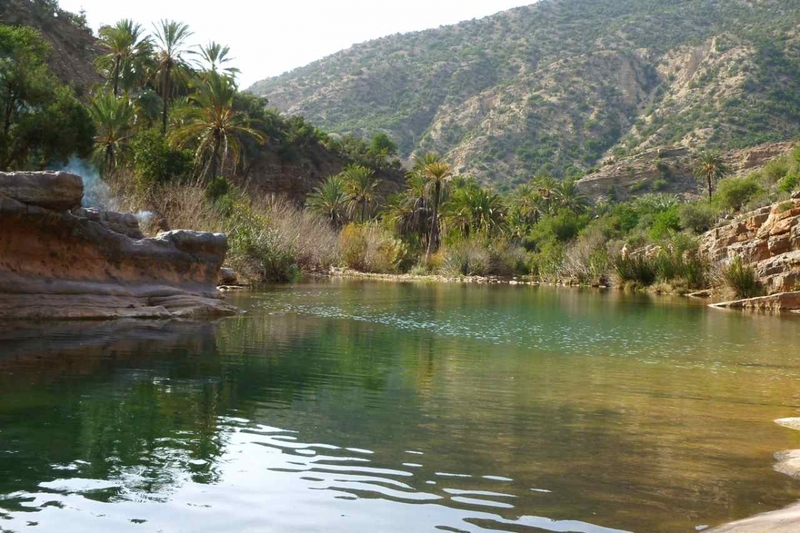 A particularly inviting stretch of the Ouankrim Valley river has been dubbed ”Paradise Valley” for it’s healing properties with sweet water springs and series of natural rock pools. Many scenic tourist drive circuits are possible through the region, both on and off road. You’ll find Argan oil co-operatives and roadside stalls showcasing local pottery craft alongside fossils, crystals and other geological finds. Take any of the roads less travelled for a full day feeling ”away from it all” Drive through gorgeous winding valleys scattered with eroded kasbah remnants. Marvel at these reminders of a modest, mysterious and strategic past. It is a lesser explored region with many untapped riches and a true village way of life that both humbles and inspires any visitor. HIGHLIGHTS OF IDA-OUTANANE: IMOUZZER – The capital of Ida-Outanane and highest village perched at 1250m altitude. Home to impressive seasonal waterfalls and also host of the annual Honey Festival. Enjoy hiking and panoramic views. PARADISE VALLEY – The most popular and easily accessible place to visit. Village Tagherat is where you will find the entrance for hiking, swimming and picnics. For the adventurous, plunging into the cool clear green waters from the rock ledges above is a highlight. INZERKI APIARY – Follow the “Honey Route” to the impressive Inzerki Beehives. The world’s largest beehive collective which is over 200yrs old. Learn about the art of apiculture (beekeeping for honey production), take a leisurely cycling tour through a rural village and stop for tea with a local family. Then dine on delectable organic goat or vegetable tagine infused with the flavours of the mountain. ASIF EL HAD – A little further off the beaten trail but well worth the journey through the stunning open landscapes. Pack a picnic and choose one of the many places to stop and admire the panoramic views. A leisurely 7 minute walk from the riad and you’ll be on the beach with sand between your toes. The nearest bus stop is just 60m from our door. Regular efficient bus service runs between Agadir city, Aourir, Tamraght, Taghazout & beyond to village Tamri. Grand Taxis can also be waved down near the bus stop, on a cheap pay per seat arrangement. For more independent travel or getting further off the beaten track: Bicycle hire, private taxis, transfer services or car hire at very reasonable prices can be arranged. We are happy to book your transfers on request.